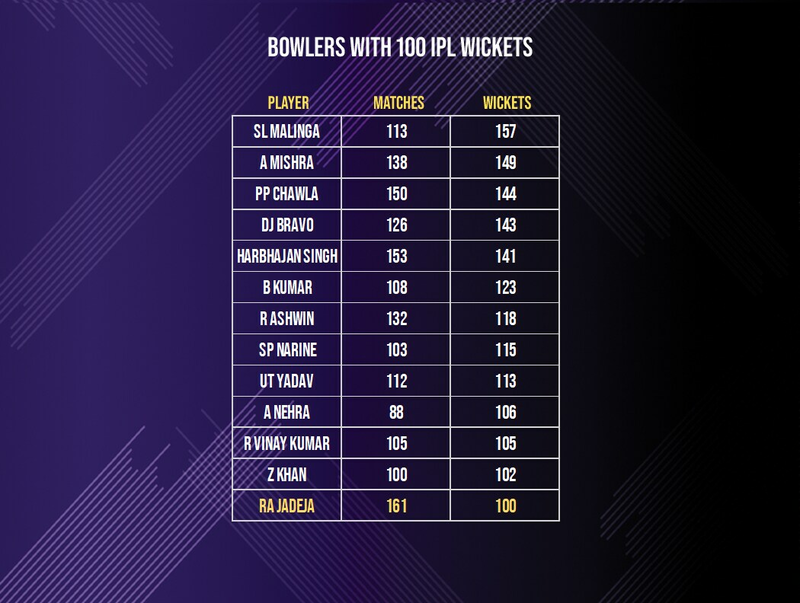 Ravindra Jadeja reached a significant milestone against RR on Thursday (11th April) when he became the 13th bowler in IPL history to join the club of 100 wickets in the coveted league. He achieved the landmark when he got the wicket of Steven Smith, having already dismissed Rahul Tripathi. Lasith Malinga with 157 IPL wickets leads the list followed by Amit Mishra with 149. The only non-Indians in the 100-plus club are Malinga, Sunil Narine and Dwyane Bravo. Jadeja is the third left-arm bowler after Ashish Nehra and Zaheer Khan to take 100 IPL wickets. He remains the only left-arm spinner in the list. With the Jaipur surface being sluggish, Dhoni used Jadeja and Mitchell Santner in tandem to silence the Rajasthan middle-order. The left-arm spinner generated sharp turn off the surface and got the better of Tripathi who holed out to backward pointafter being dropped by Dhoni earlier (off the bowling of Santner). He had the wood over Smith and picked up the former Australian skipper’s wicket for the fifth time in the IPL. Jadeja has also dismissed Smith once each in T20Is and ODIs and four times in Tests. In the IPL, the left-arm spinner has bowled 61 balls to Smith and conceded at less than run-a-ball while bowling 24 dots. Dhoni’s ploy to bring Jadeja against Smith had statistical backing and it worked on Thursday. Jadeja finished with impressive figures of 2/20 in his four-over spell and in the process took his tally of wickets to seven in this IPL. He delivered as many as 9 dot deliveries and conceded just one boundary in his restrictive spell. 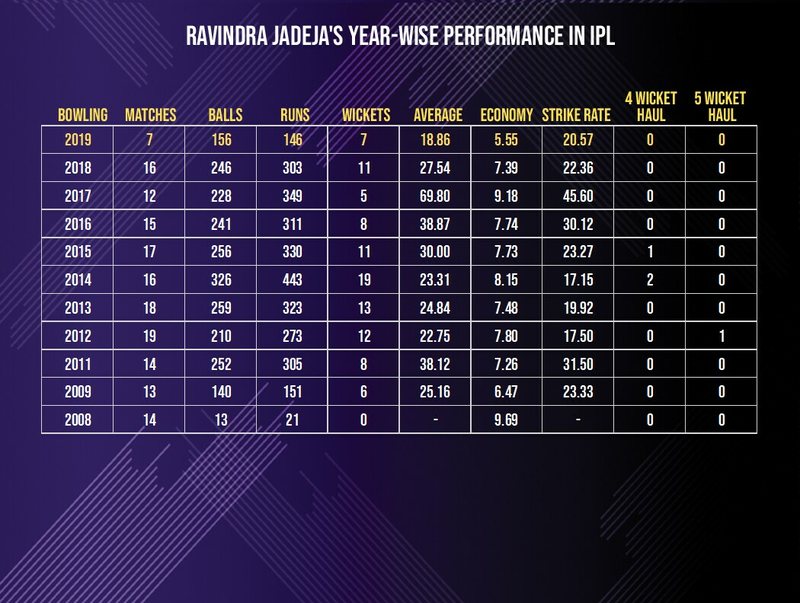 Jadeja’s average of 18.85 in 2019 (24 overs bowled in 7 matches) is his best in any year of the IPL. This is also the first time he has gone below an economy of 6. In fact, he has never conceded at less than 7 an over in any season of the IPL since 2009. He is currently the third-most economical bowler of IPL XII after Harbhajan Singh and Mohammad Nabi. The maximum wickets Jadeja has taken in a season was in 2014 when he picked 19. He has taken more than 10 wickets in a season five times, but this year, going by his performances so far, he is well on track to making it his most successful season ever.